One Story Living Room and Family room plan with 4 bedrooms, 4 baths, powder room, plus a Bonus Room and Library. 3 car garage. Island Colonial Influenced elevation. Creative floor plan takes full advantage of the acre homesite with all main living areas on the view. Living and Dining room views take full advantage of the outdoor living area and pool with 13′ ceilings and expansive glass windows. Library opens onto the pool deck and features handmade built-ins. Roomy Owners Suite overlooks the poolside Gazebo with generous his and hers closets. 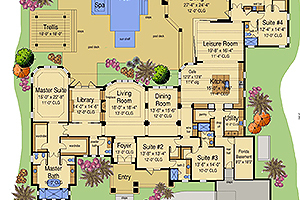 The pool side Bonus room and Bedroom Suite may serve as a VIP area for extended stay guests. 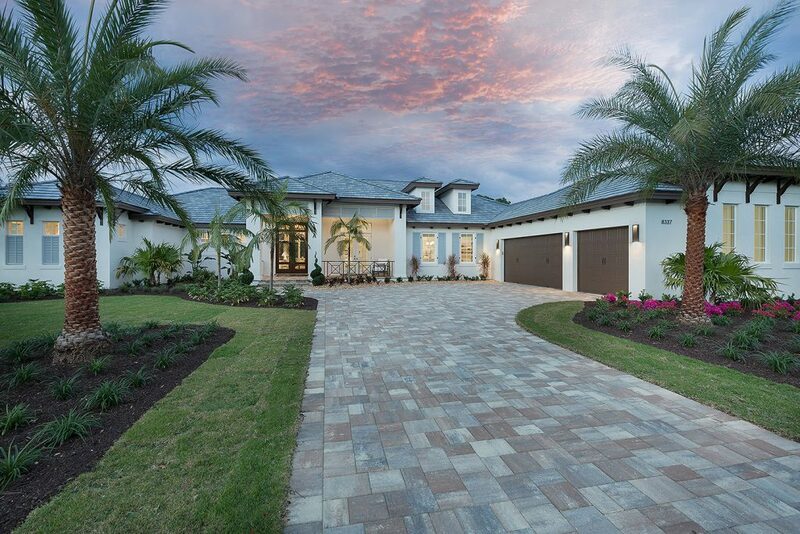 Florida living is personified with the Outdoor Living with Kitchen, Bar, Dining and Lounging area facing the fireplace. Warm and inviting describe the home’s centerpiece for Florida living, encompassing the kitchen, casual eating area and Leisure room, creating the perfect hub for daily activities. Interior architectural detailing and furnishings provided by Marc-Michaels Interior Design, the incomparable leader of model home design as well as nationally recognized design firm.